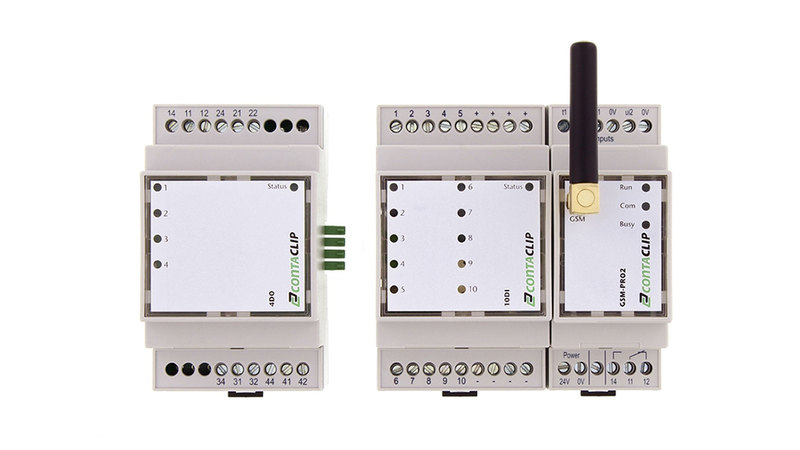 CONTA-CLIP&apos;s GSM-PRO2 modules provide a 2G/3G and 4G remote control and maintenance solution which allows you to monitor and control decentralized facilities. The GSM-PRO2 module informs you when your process has achieved a user-defined status or limit value. Digital and analogue inputs values can also be transmitted via e-mail or SMS (text message). The digital relay outputs can be switched using an SMS sent from the decentralized control room or from the service technician. So the process can be monitored and controlled remotely. Android and iPhone apps are available to make the monitoring and control functions of the GSM-PRO2 modules even easier to operate. A user-friendly browser-based application can be used to configure the module´s inputs and outputs and their required functions.